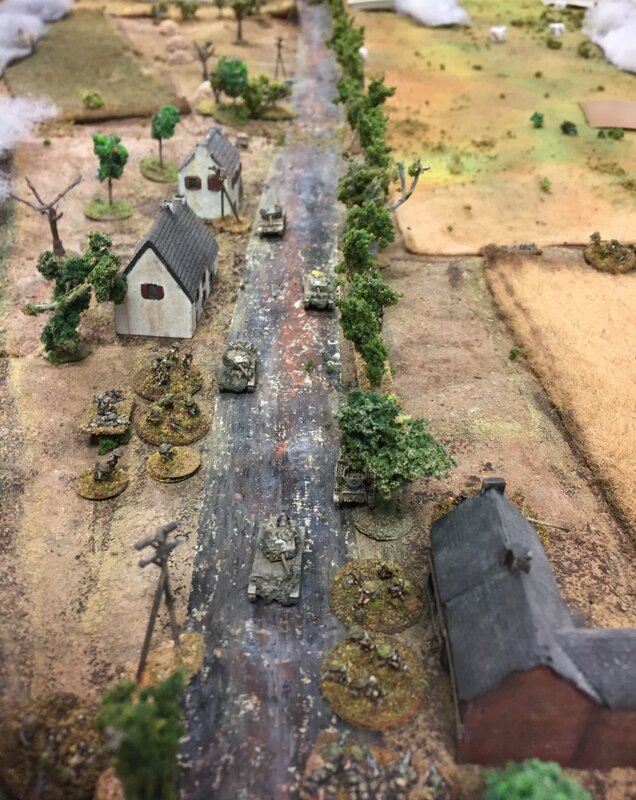 A 6mm IABSM game played at Giga-bites Café Spring, 2017, this scenario is the action that took place on the outskirts of Kolonie on the Belgium-Dutch border on the morning of September 14, 1944. The Allied bridgehead was held by the 5th Coldstream Guards (11 Armoured Division) with C Squadron of the 15/19 Hussars just down the road. 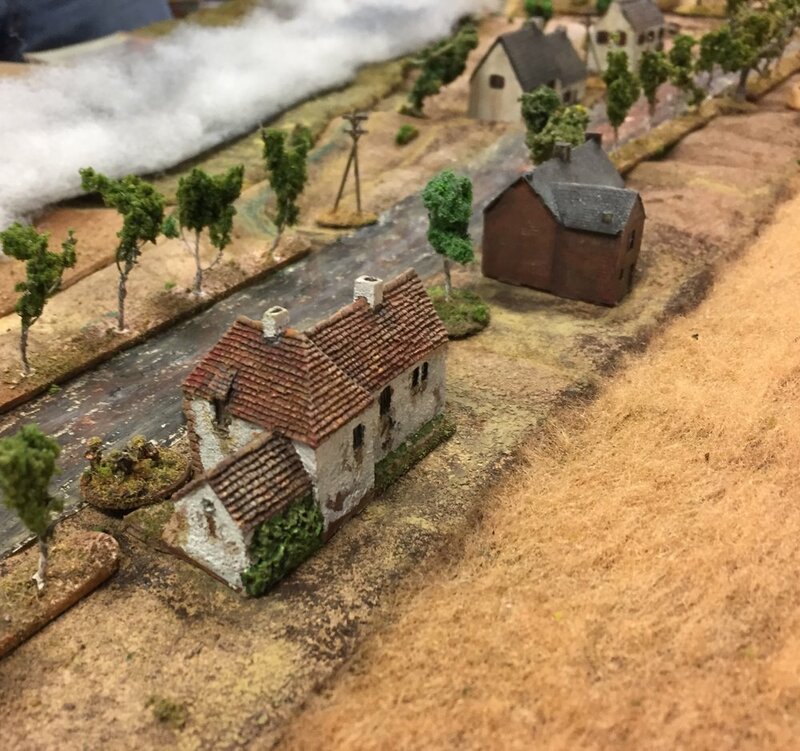 The German units coming down the road straight for the canal consisted of 6 Luftwaffe BewahrungsBatalillon zur besondere Verwendung (a Luftwaffe penal unit) and Sturmgeschutze from 2/559 schwere Heeres Panzerjager Abteilung. A cold grey mist created an obscured battlefield across the bridgehead over Maas Scheldt canal (south, to the right). I wanted to create the sense of bad visibility so put out strips of grey angelhair. The idea was that after three appearances of the Turn Card it would go from badly obscured with a visibility of '12 inches plus a die roll' to slightly obscured of 'a die roll inches'. 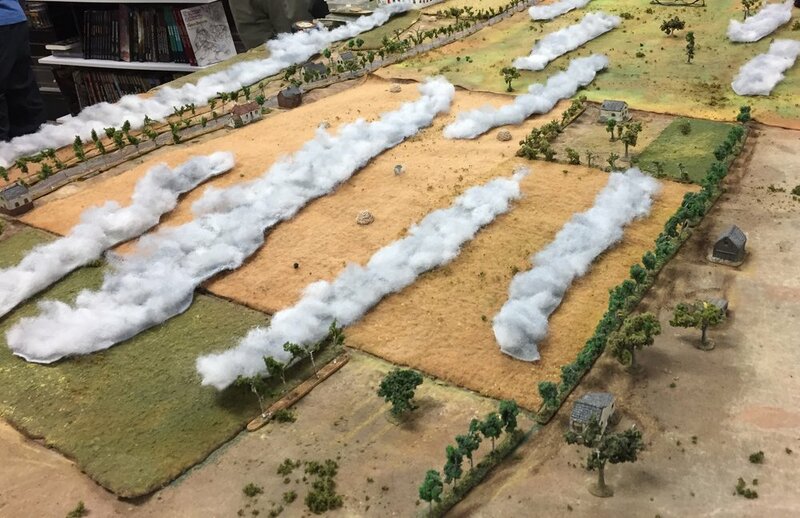 It would also allow the Germans to close up and have a chance to get into the British defensive line which was wrapped around the road and off to their left. The Germans started with a full strength company (good regulars) of three platoons of three sections each. Two of the platoon leaders were only status I with the third at status II. All sections had a panzerfaust and there was one panzerschreck team. Matt had the Luftwaffe infantry and Martin had the StuGs. They did get a pregame stonk. This turned out to have KO'ed one of the British 17 pdrs, and killed one man in 1st Platoon. The advance was spotted early and they starting taking hits. 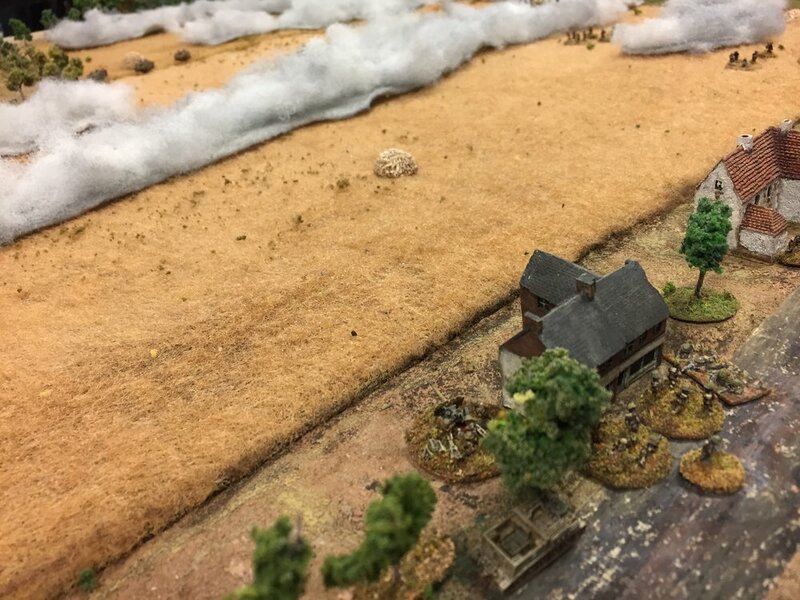 The 2nd Platoon was dug in along a drainage ditch and the 1st Platoon was dug in among the front buildings of Kolonie. William T was the defender. 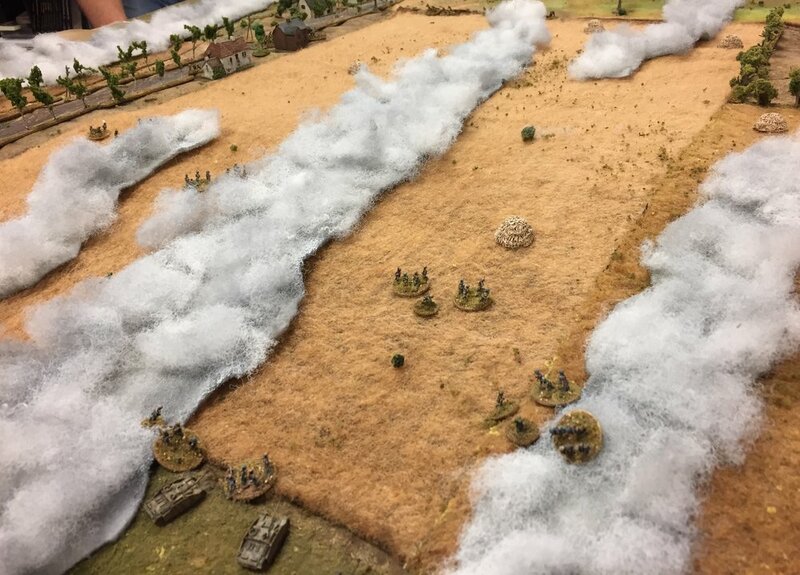 There were six StuG IIIGs swinging out to the right. 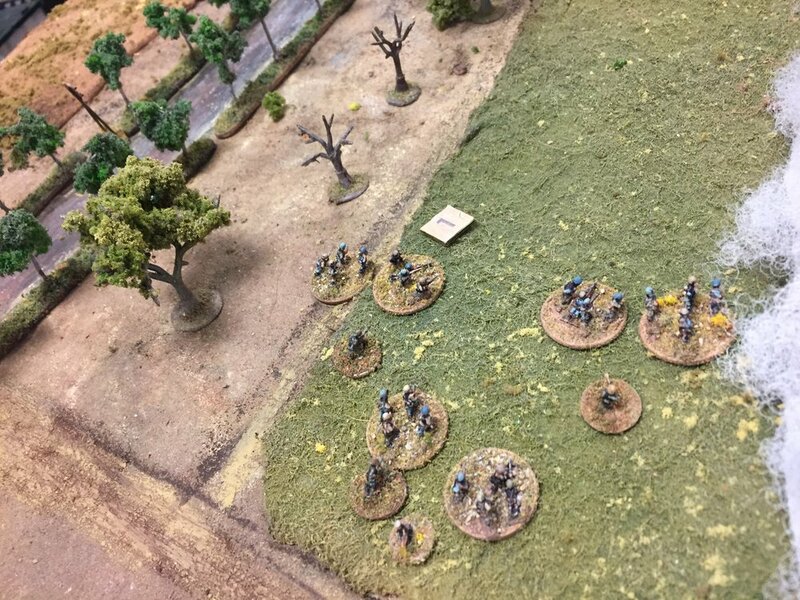 With variable visibility we just kept the units on the table and rolled to see if they could be spotted by firing units. It cost an Action to spot, so the Luftwaffe infantry was at a disadvantage: they only had 3 Actions to start. At the same time that this advance was taking place, another German attack was taking place further south (to the right here). 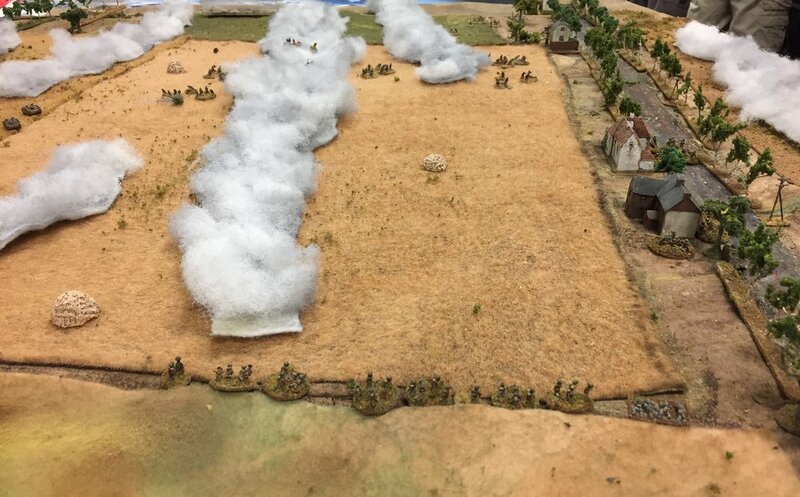 The 1 and 2/FJR6 (von der Heydte) were trying to get to the canal and finding the 3/Irish Guards and A Squadron 15/19 Hussars blocking them. I imagine the fog was making these men rather anxious as they would be hearing sounds of battle to the left and rear. This game was smack dab on the Dutch Belgium border. Which had the Platoon HQ, a section and a 17 pdr stationed outside. This was the main casualty from the pregame stonk, as it was damaged in the barrage. 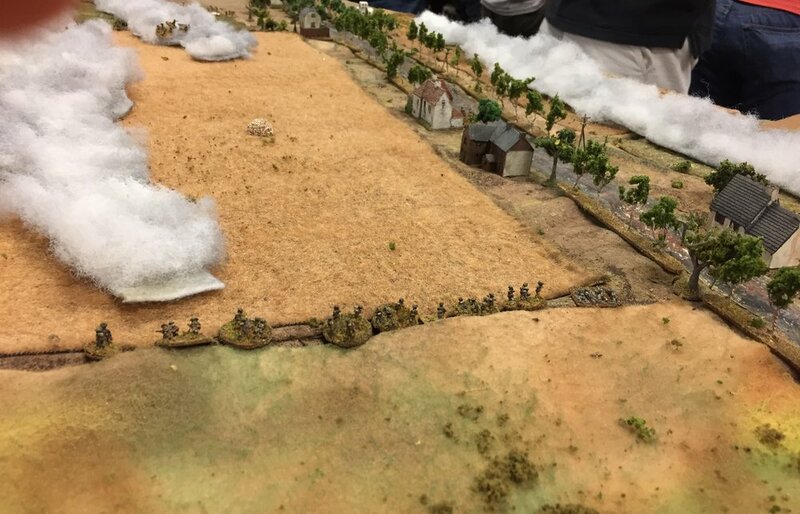 The 1st section was taking hits so they made the switch with a fresh section before the Germans got too close. The Company CO takes the lead on the left. The 17 pdr did disable the third StuG and several Luftwaffe men are down. One section is pinned. 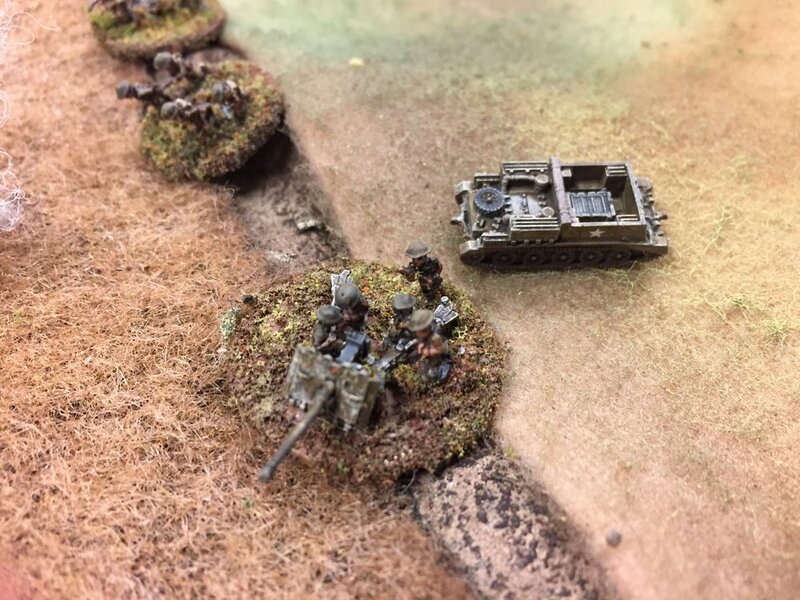 The PIAT crew was wiped out by a StuG. We were wondering just how long this fog would last. The first two Turn Cards popped up quickly...the third one: never. The British positions are still out of reach though. John F had the Hussars in this one. Each troop had three Cromwells and a 17 pdr-armed Challenger. 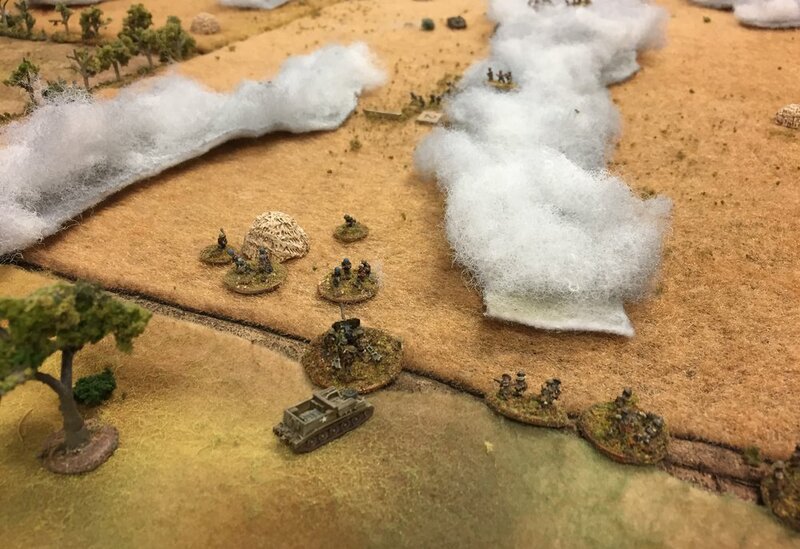 The 3rd Platoon is also moving up to make sure the Luftwaffe men do not get any closer. Inferior troops have trouble closing. robably the high water mark of the German attack. This troop, under Lt Michael Roderick, includes a +2 tank ace: Sergeant Maurice Hollis and gunner Trooper Jewiss. oo much firepower overwhelms the Germans. GHQ model with Adler crew. Down to two in the crew. 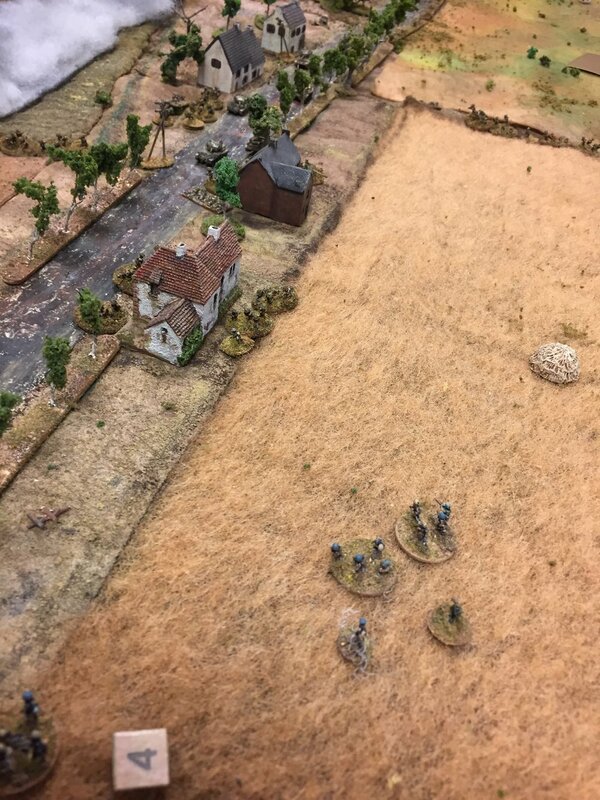 And so is the German advance. 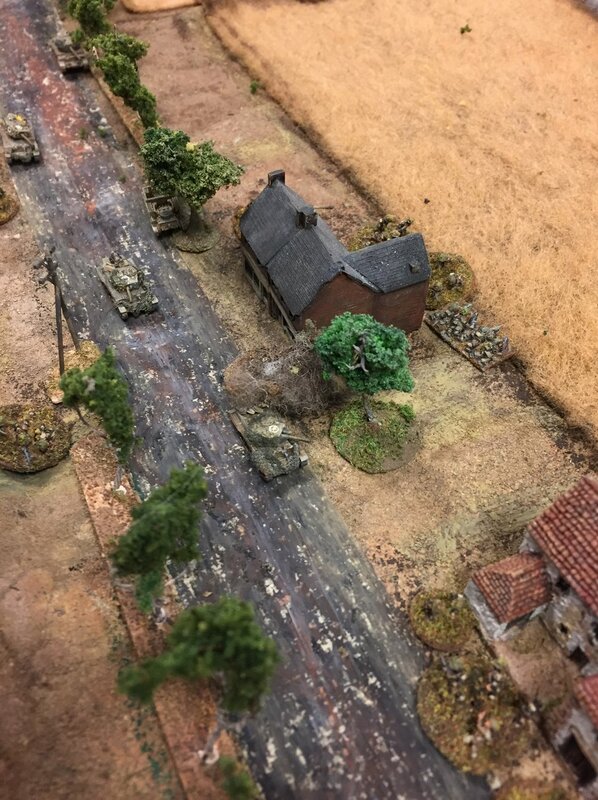 The panzerscheck and 'fausts hit the lead Cromwell and they scramper back to Holland. We never did get the third Turn Card, so at this time we decided to increase visibility. I believe it was hit by the panzerschreck team. I think the panzerfaust missed. 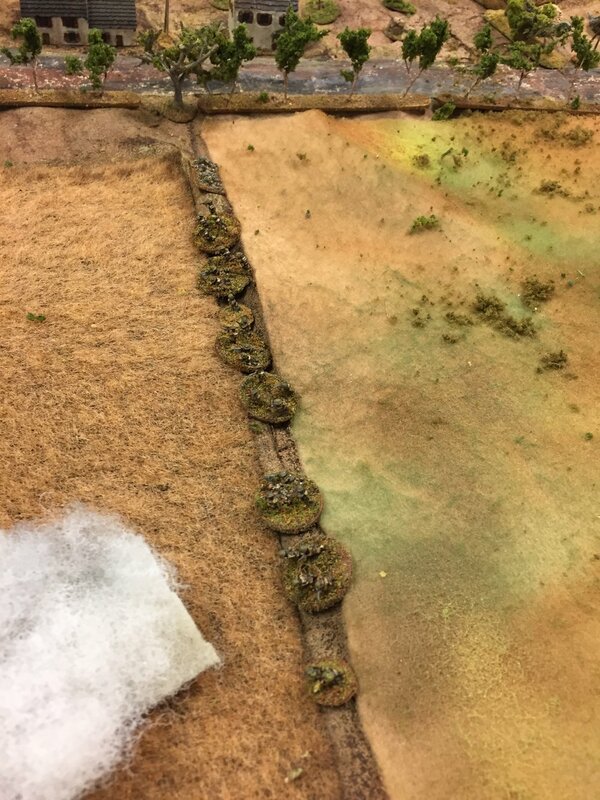 At the end, the mediocre Luftwaffe troops and the StuGs pull back. The Germans lost four full sections and several others: a total of 46 men and a StuG. The Brits had much fewer infantry casualties: 11 men and one Platoon Leader, a PIAT team, and two Cromwells. Historically, the German attack also petered out. Sergeant Hollis received a Military Medal, and Roderick the Military Cross. The appearance of the Hussars was the turning point in the game and in actuality.